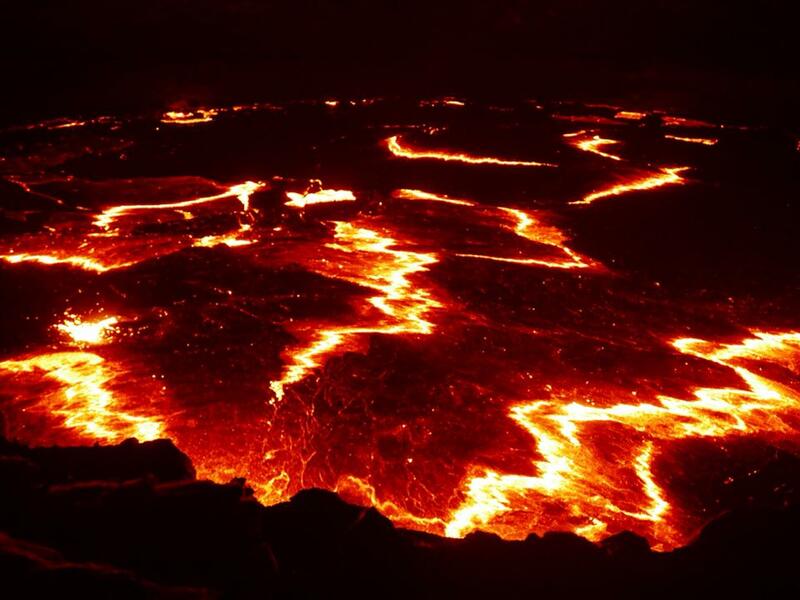 Another insane place! 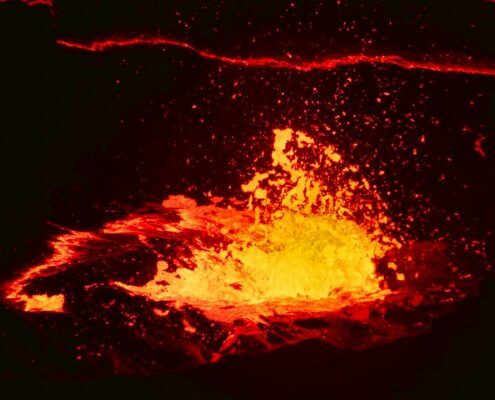 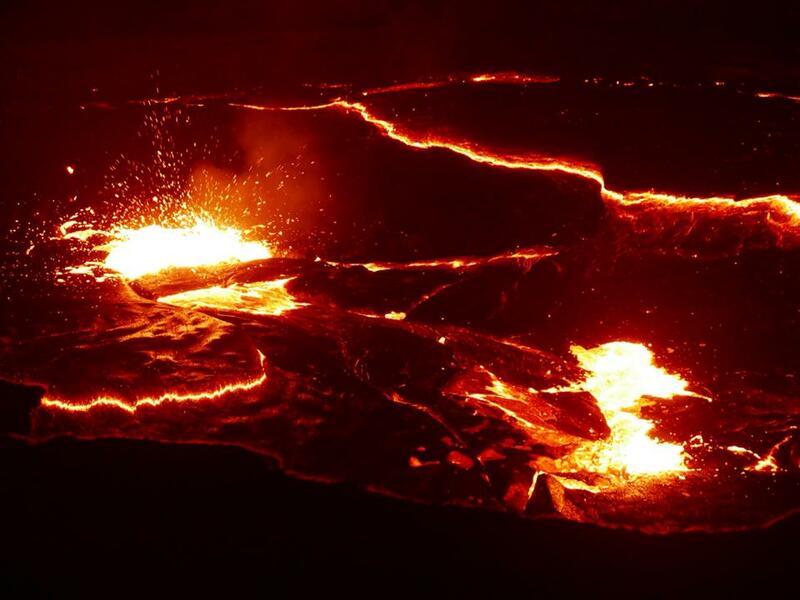 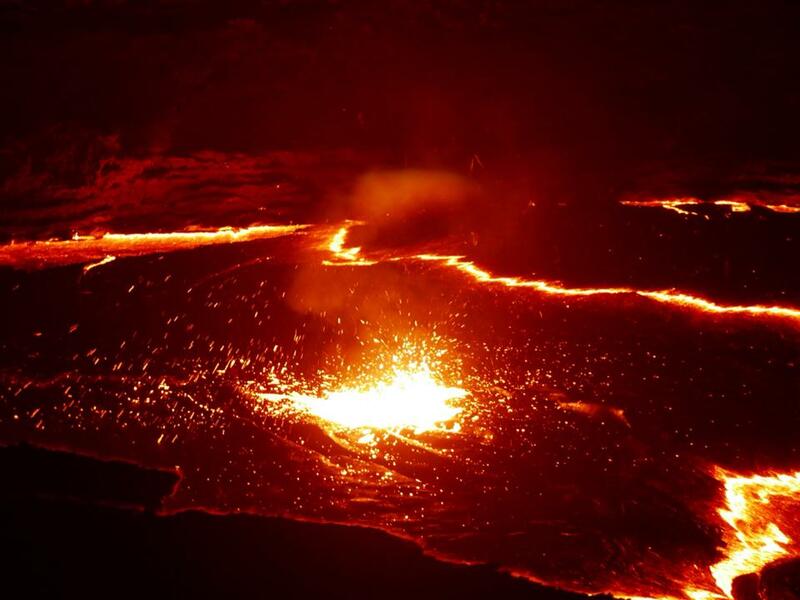 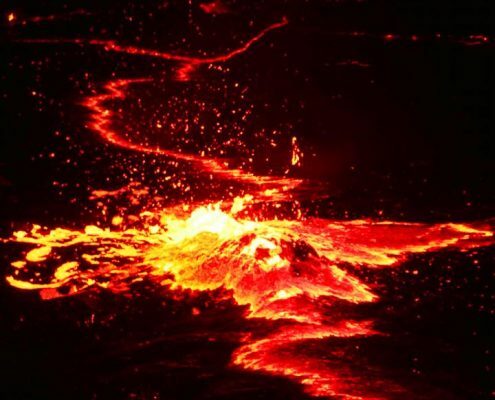 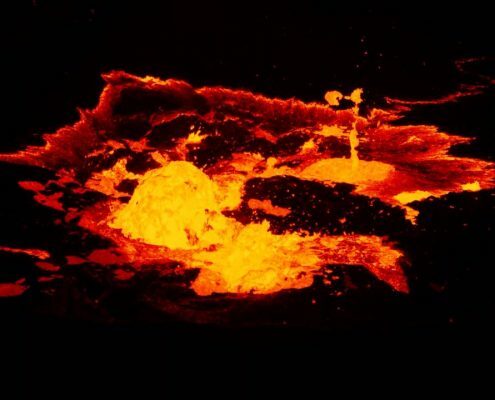 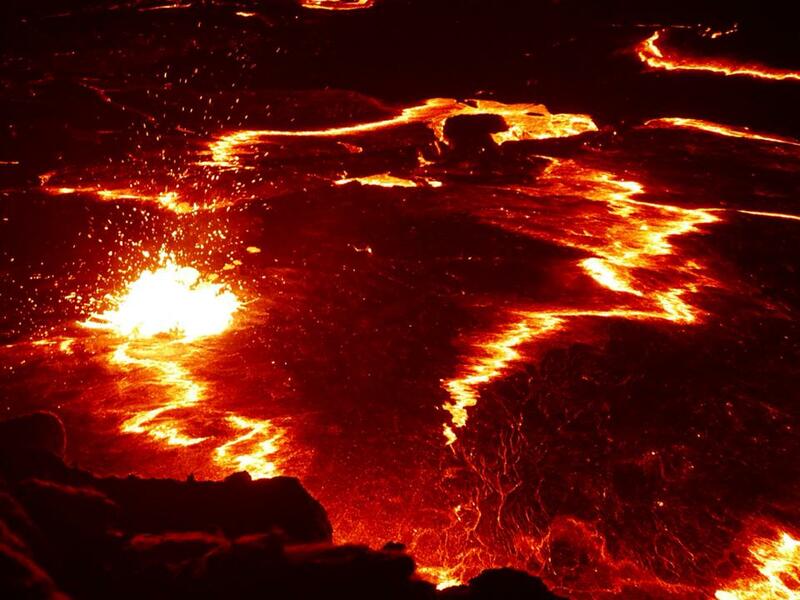 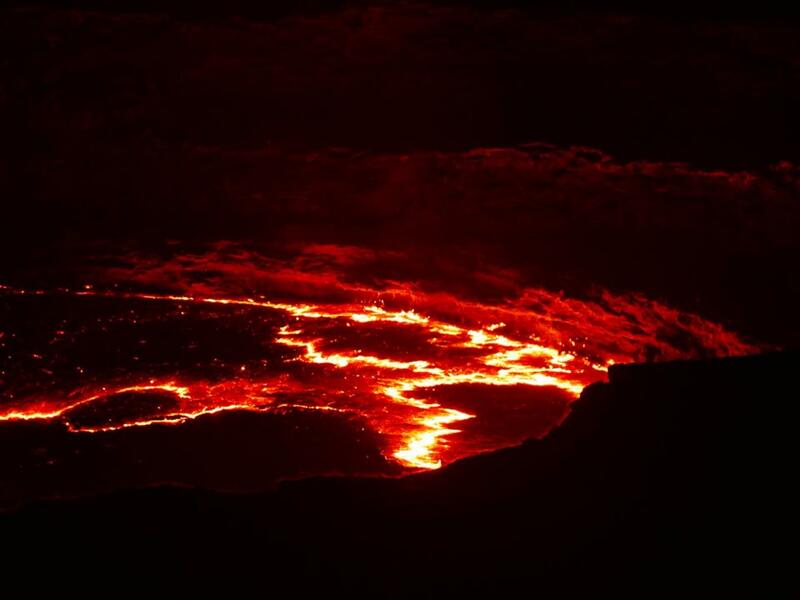 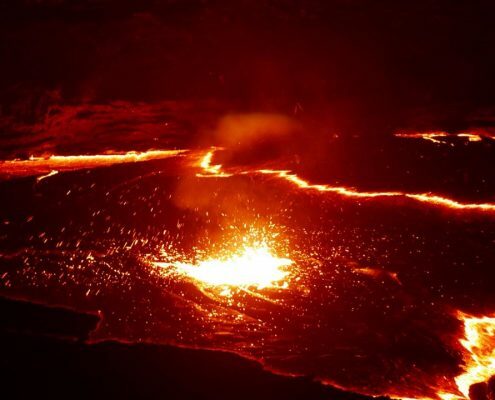 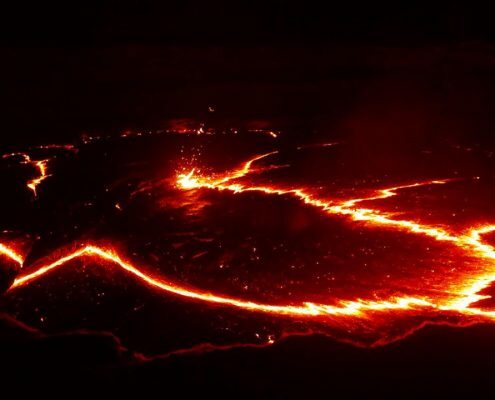 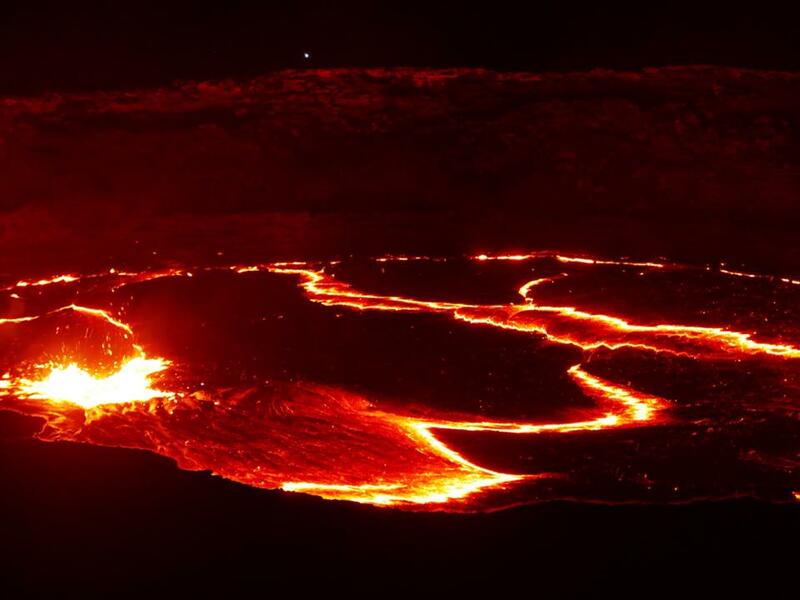 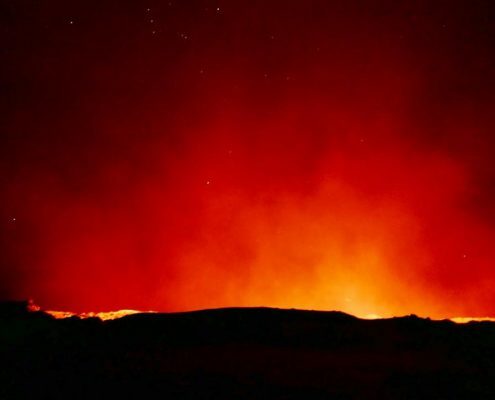 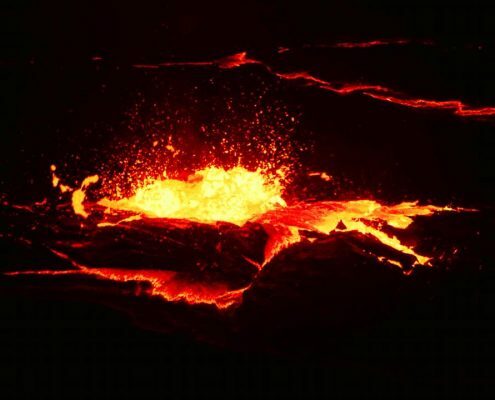 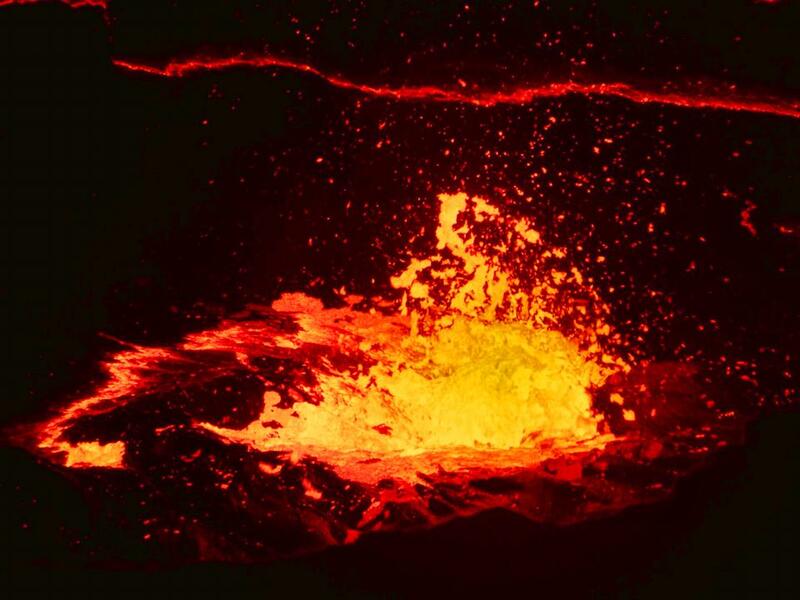 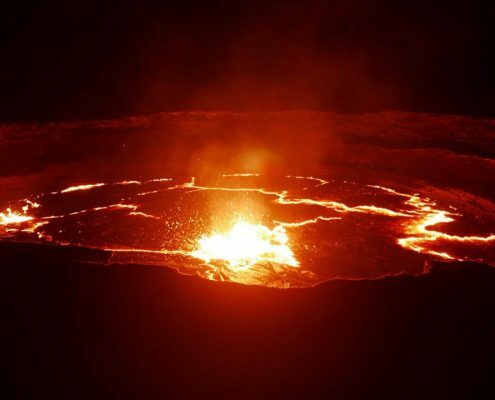 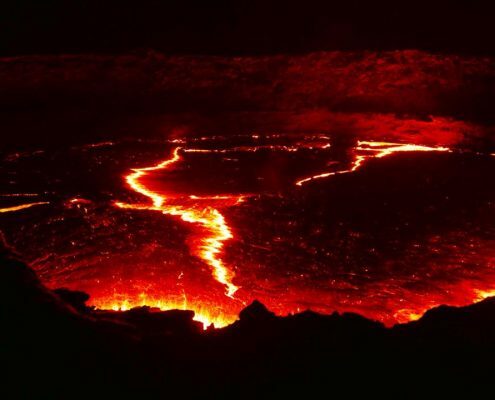 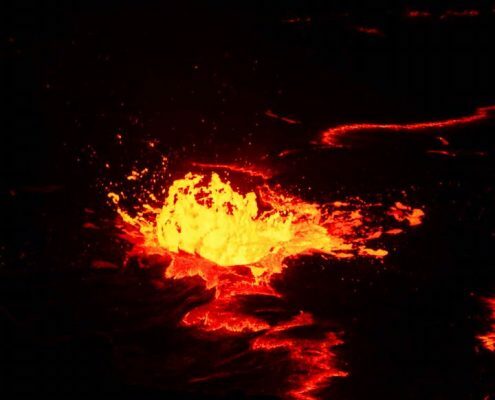 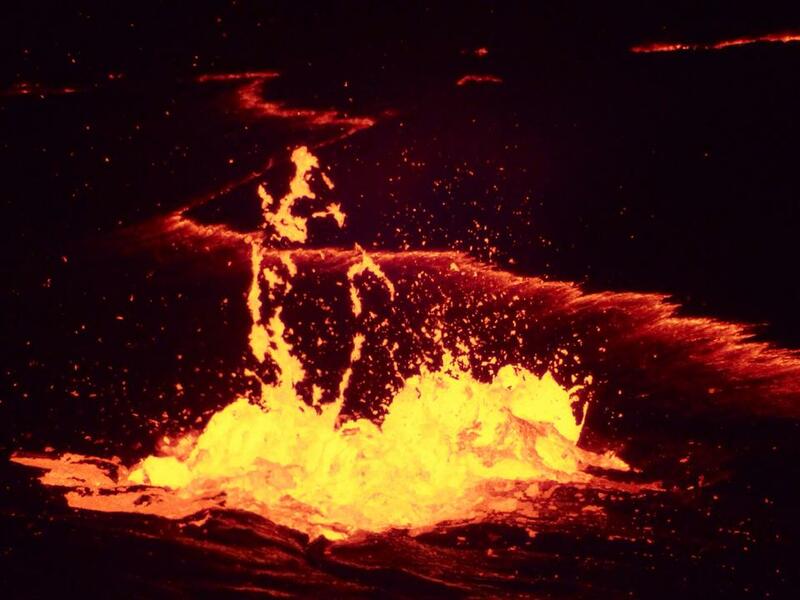 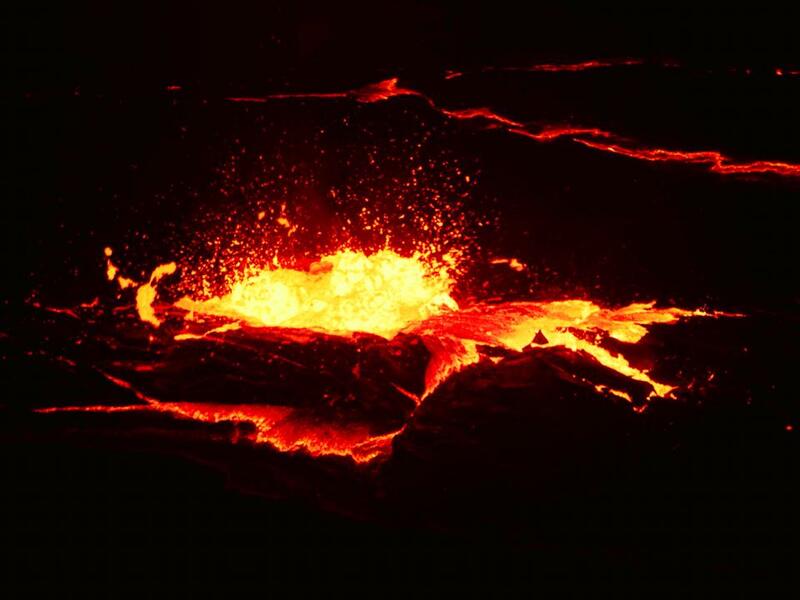 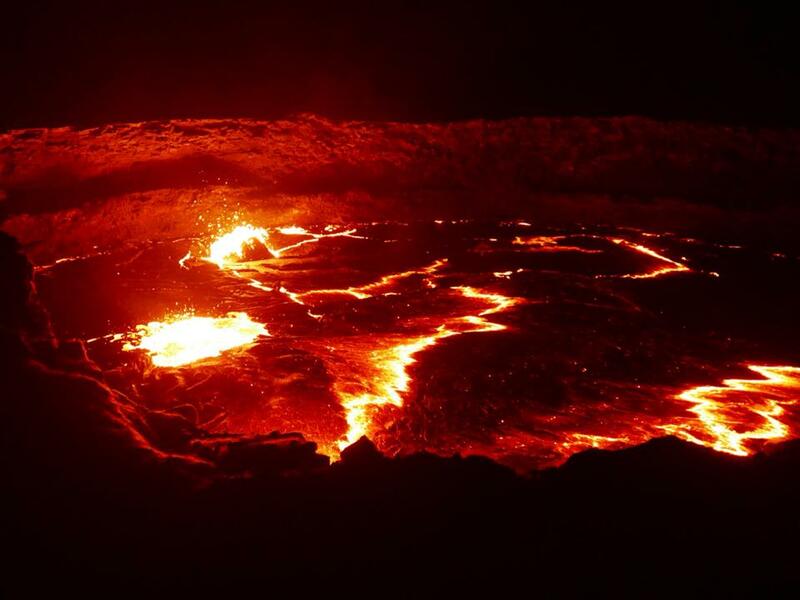 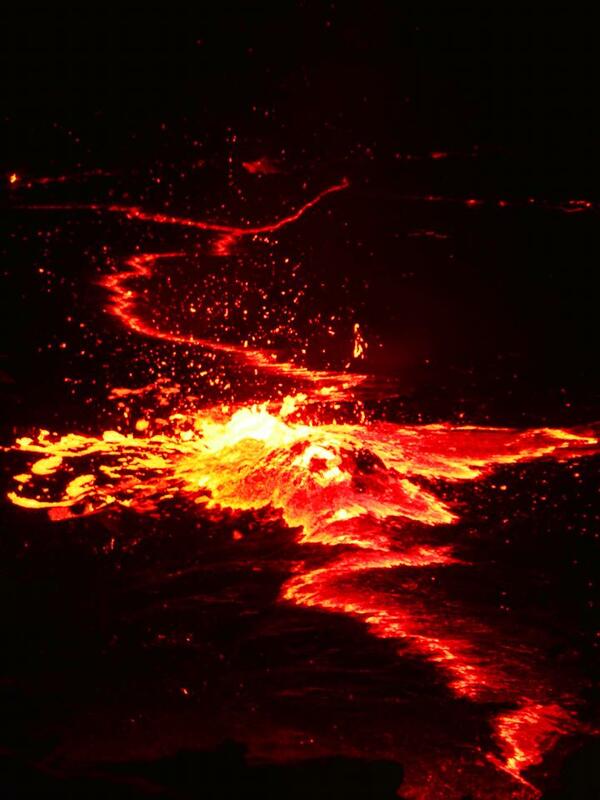 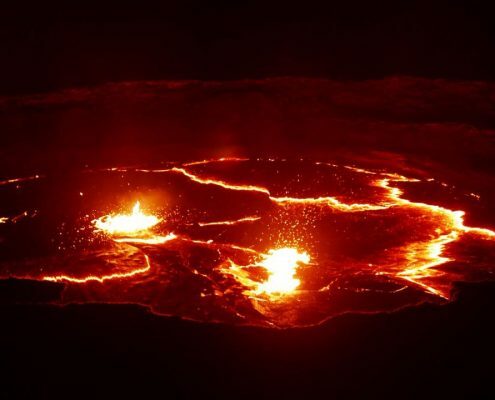 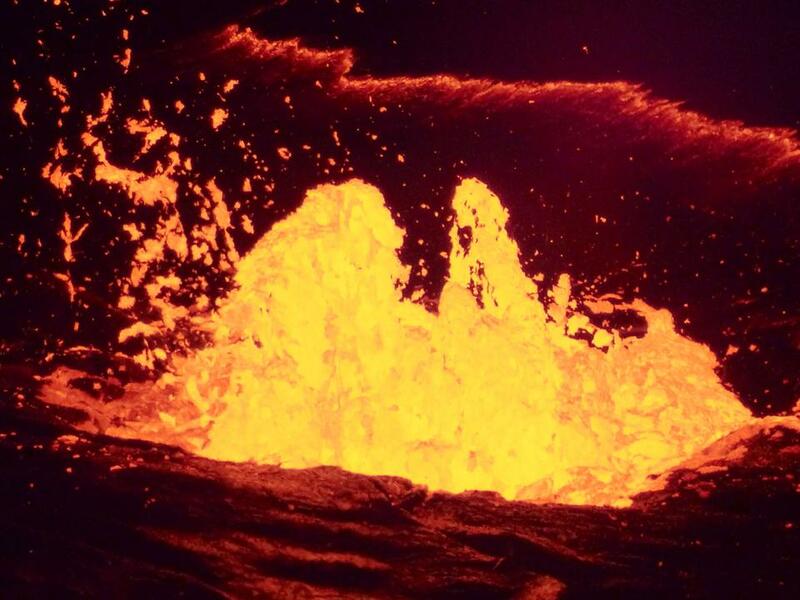 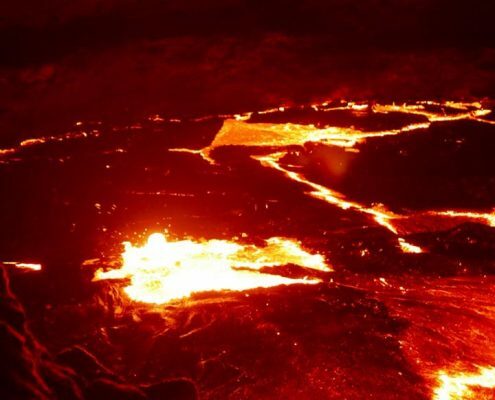 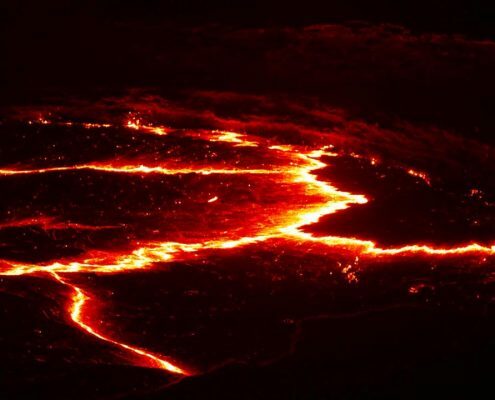 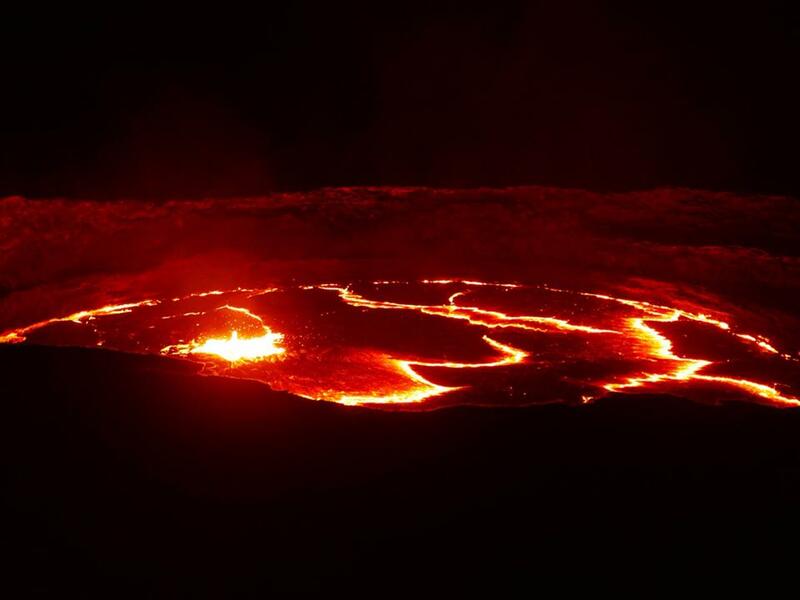 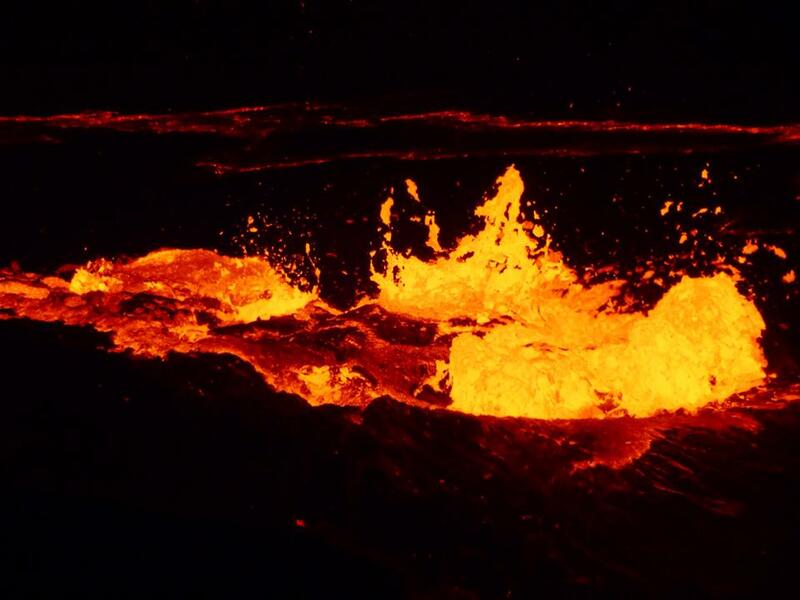 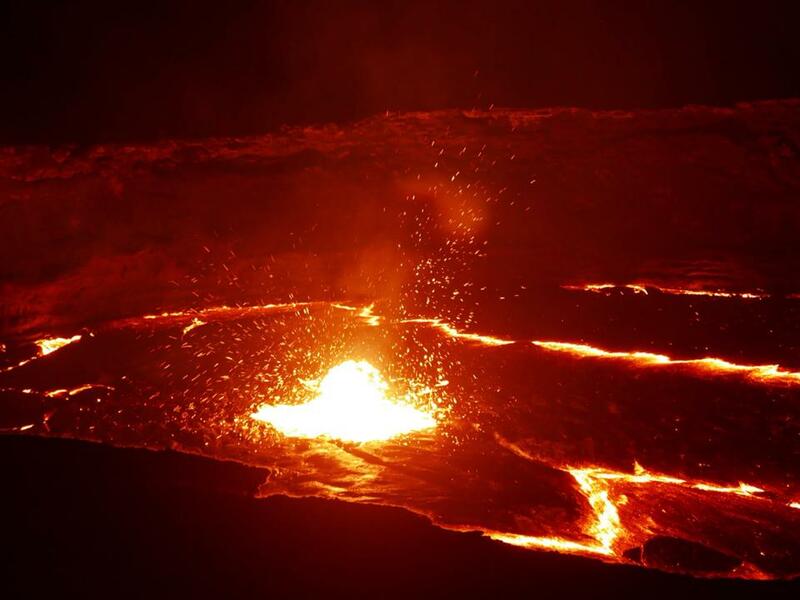 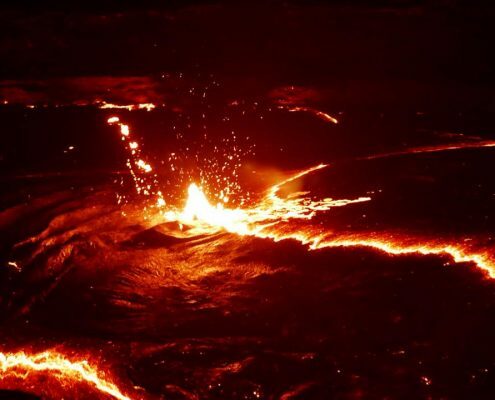 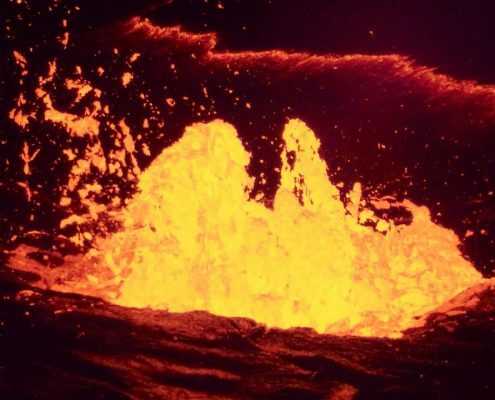 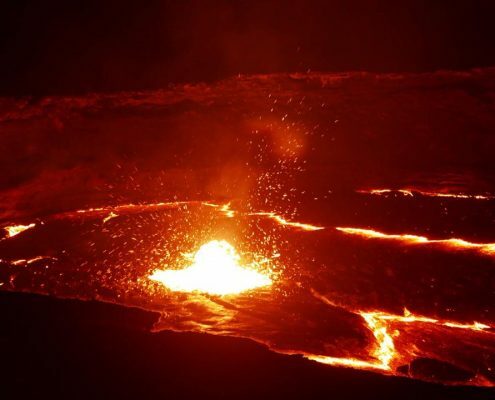 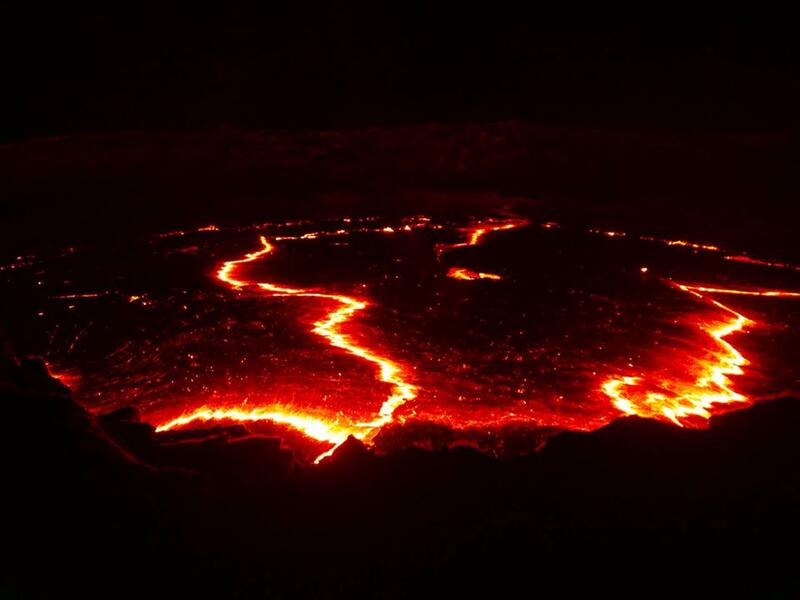 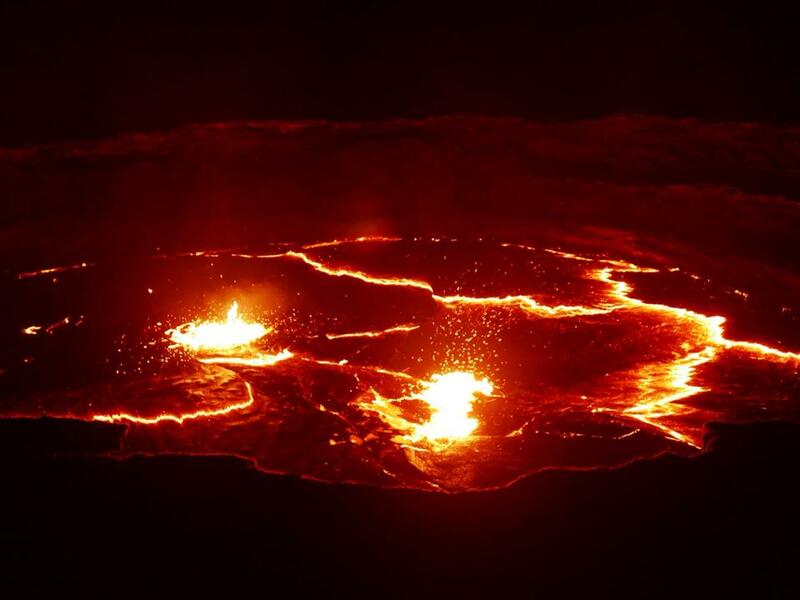 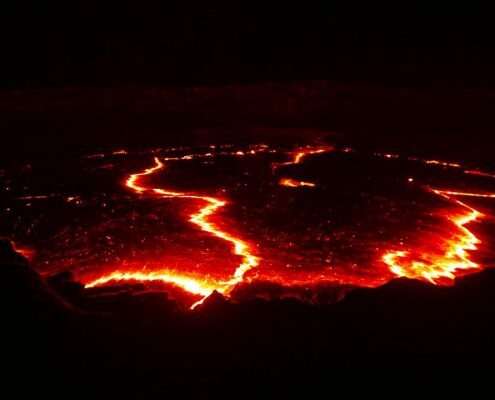 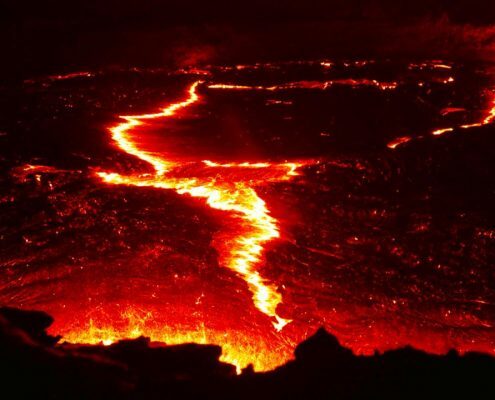 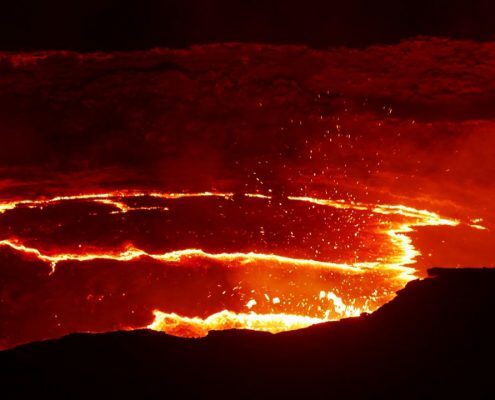 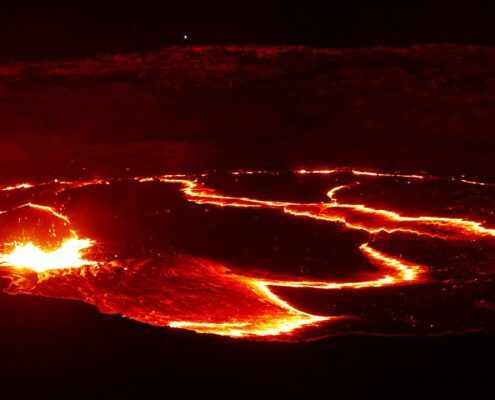 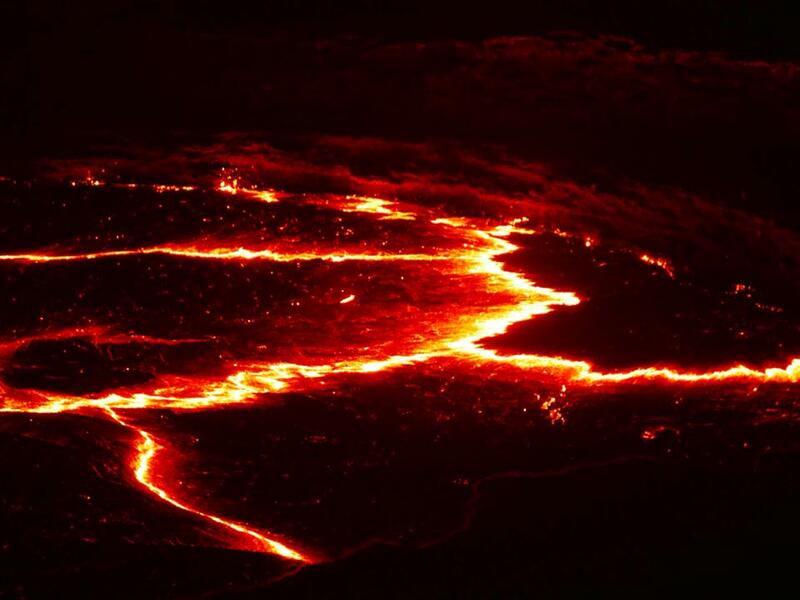 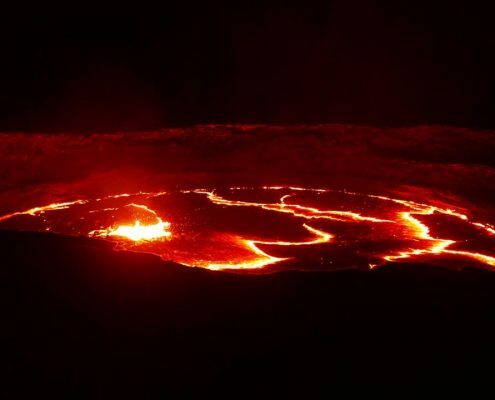 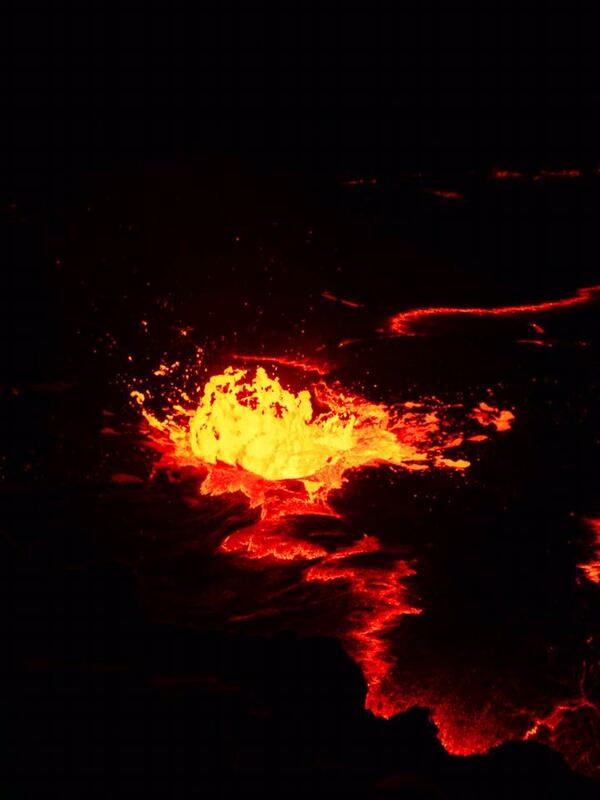 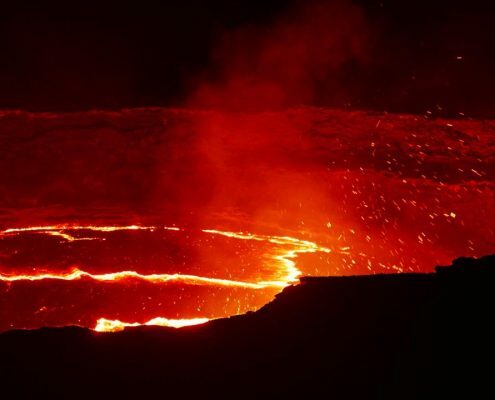 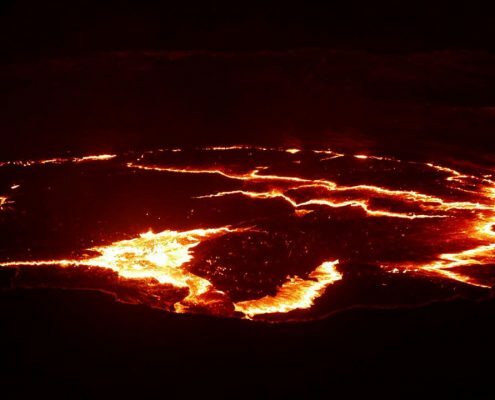 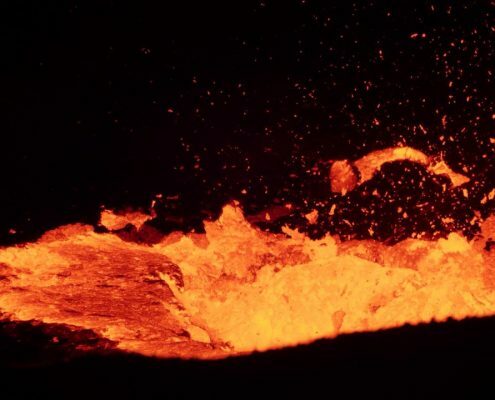 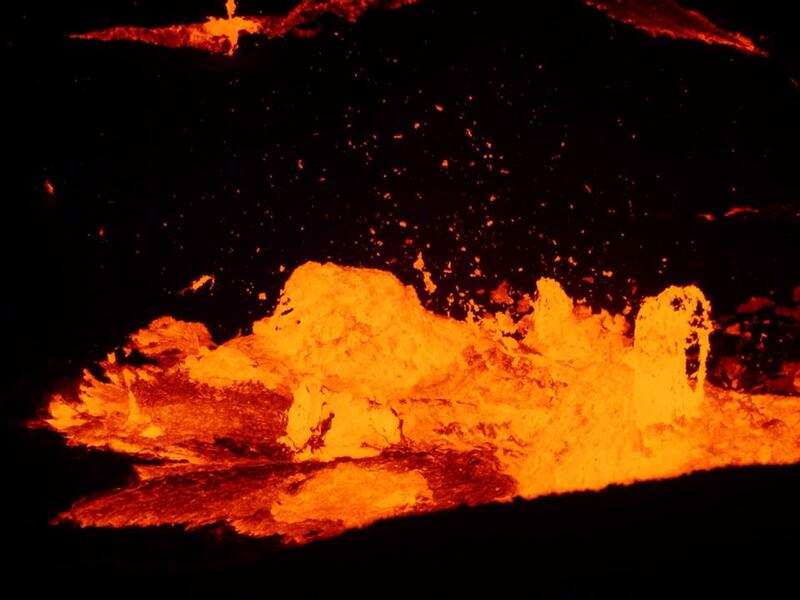 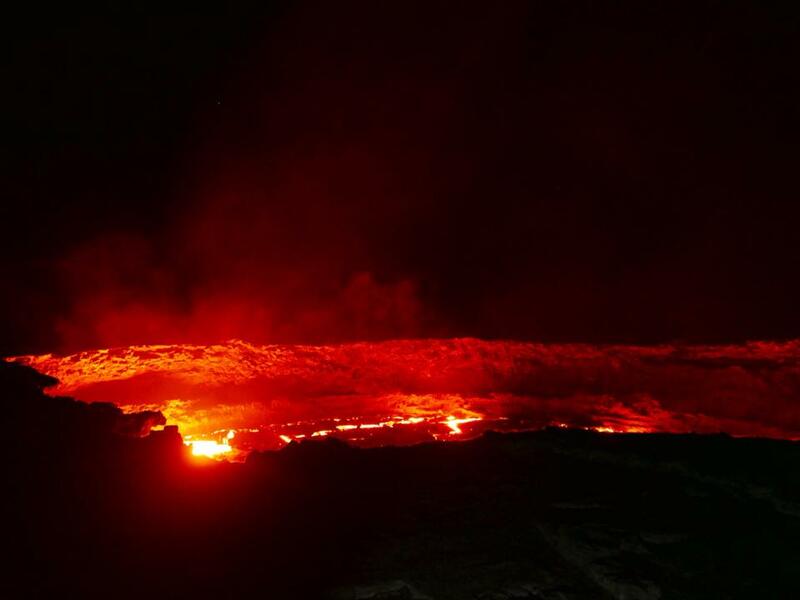 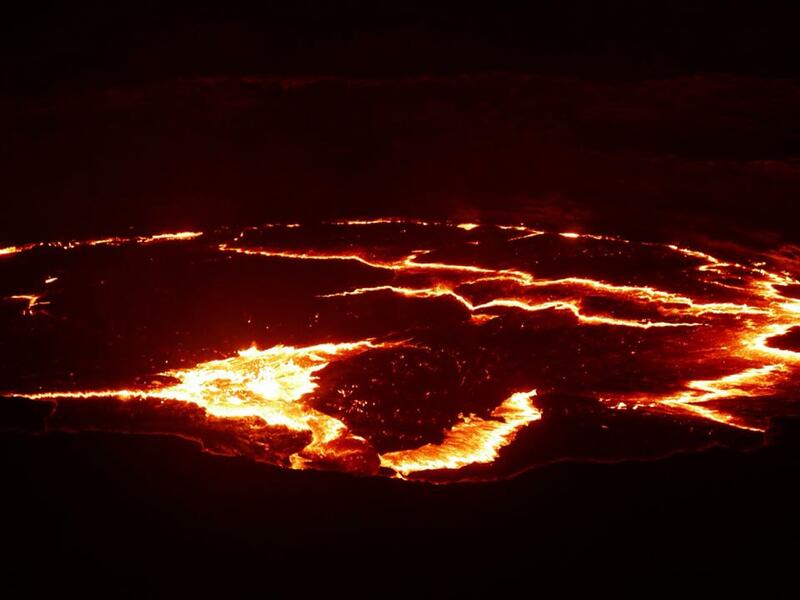 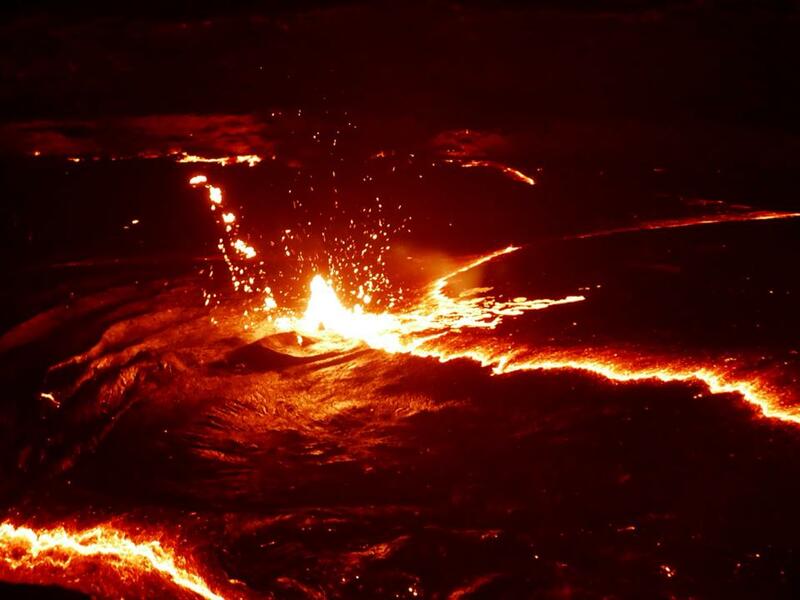 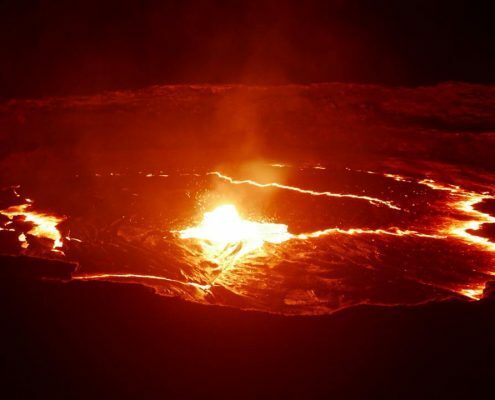 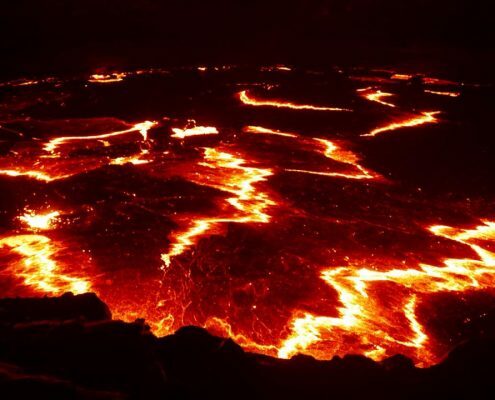 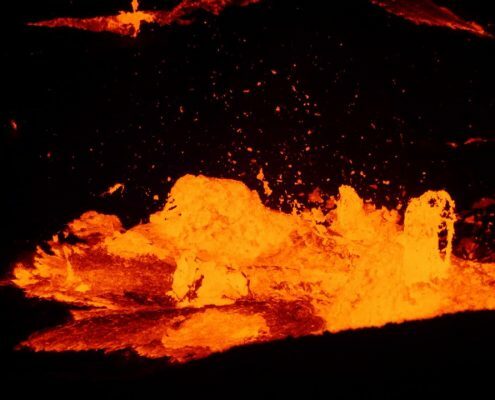 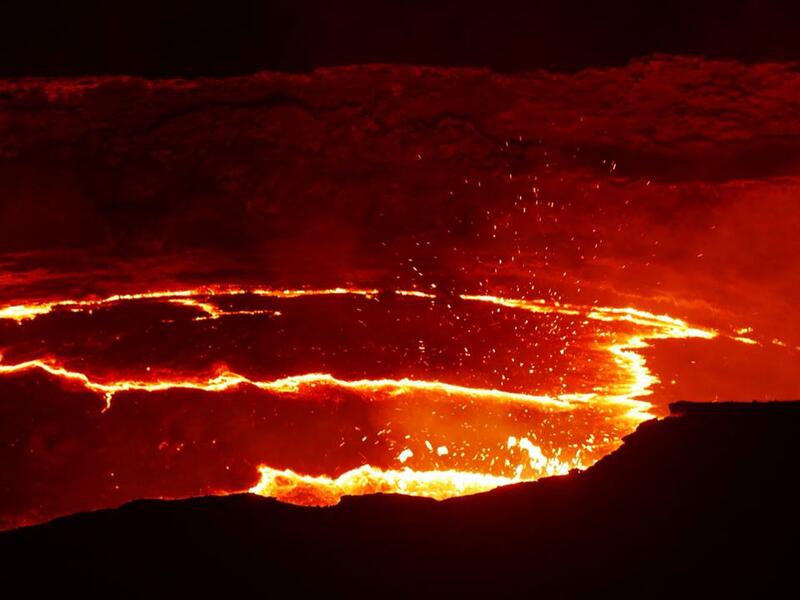 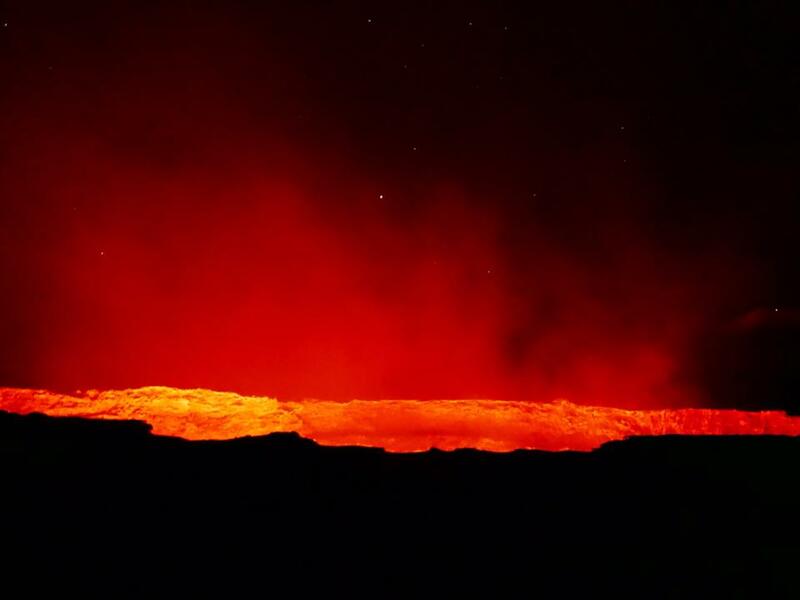 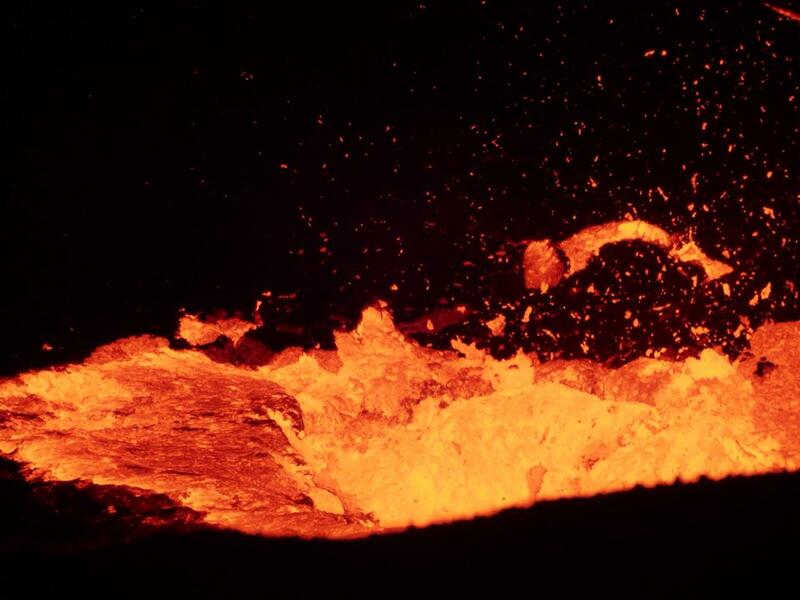 Erta Ale is an active volcano in the south of the Danakil Depression, it rises 613m (2011 feet) above see level. 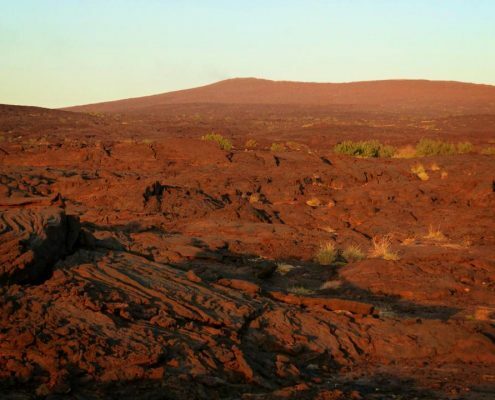 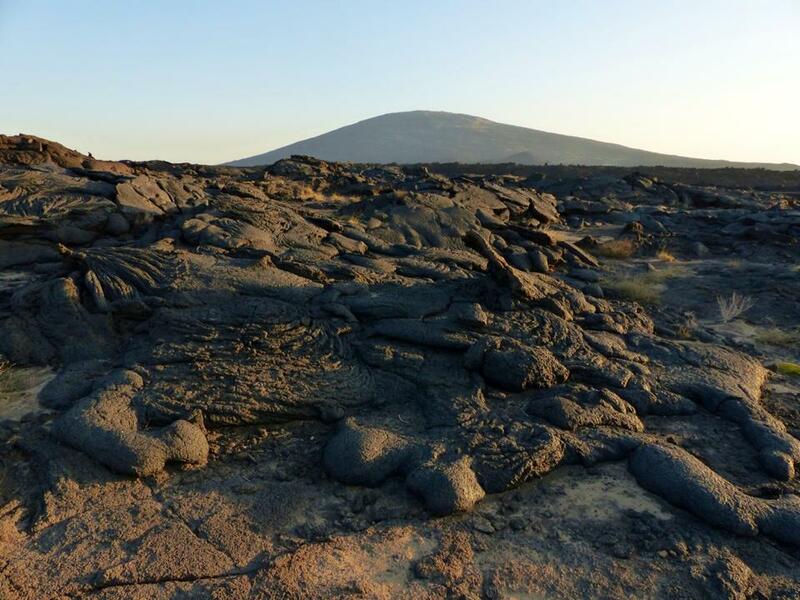 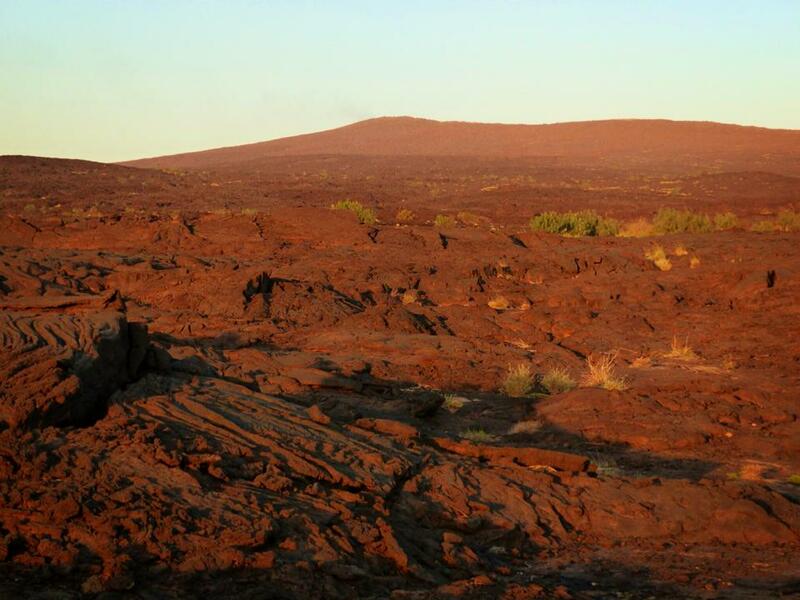 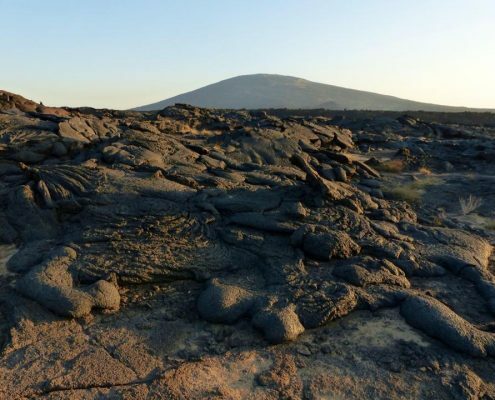 However to climb it, you start at -400 feet below sea level so it’s a long hike of 15km over old black lava flows. You start at around 5pm in the evening, see the sun set as you go up and continue climbing in the darkness. 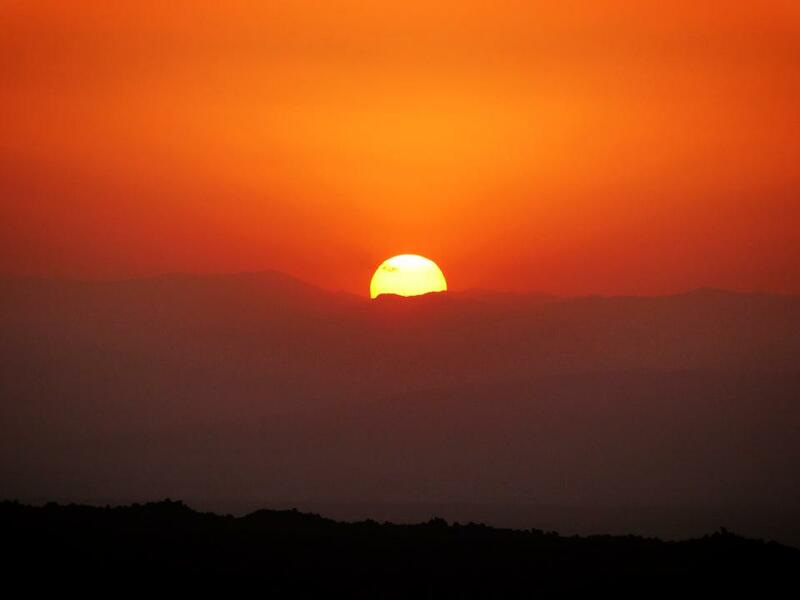 You sleep on the rim. The reward – a massive boiling lava lake crater (there are only a few in the world as the phenomenon is very rare). 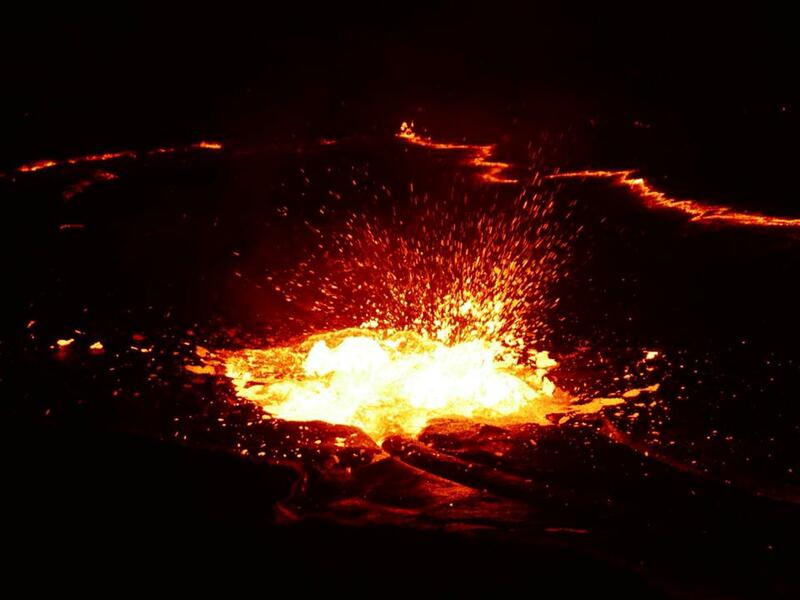 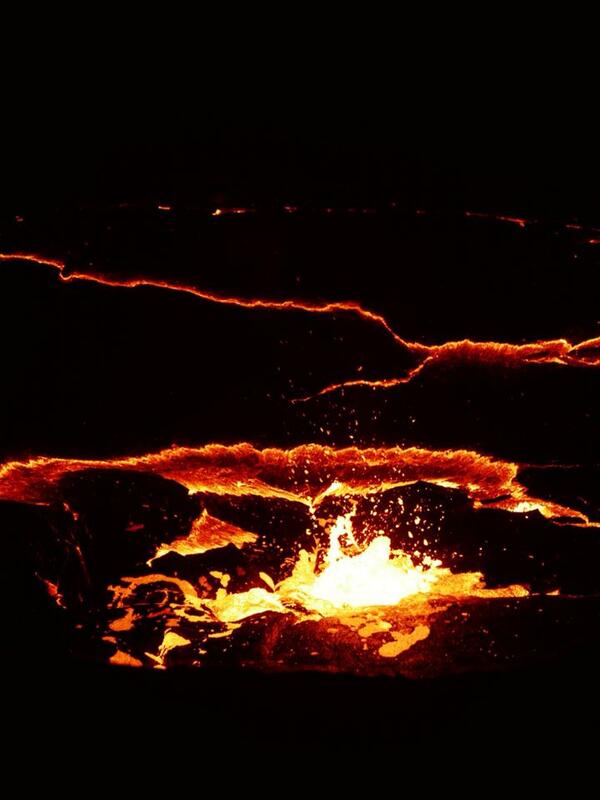 It’s the most amazing sight and experience standing on the edge of the crater with the lava exploding and bubbling just 50 feet below! 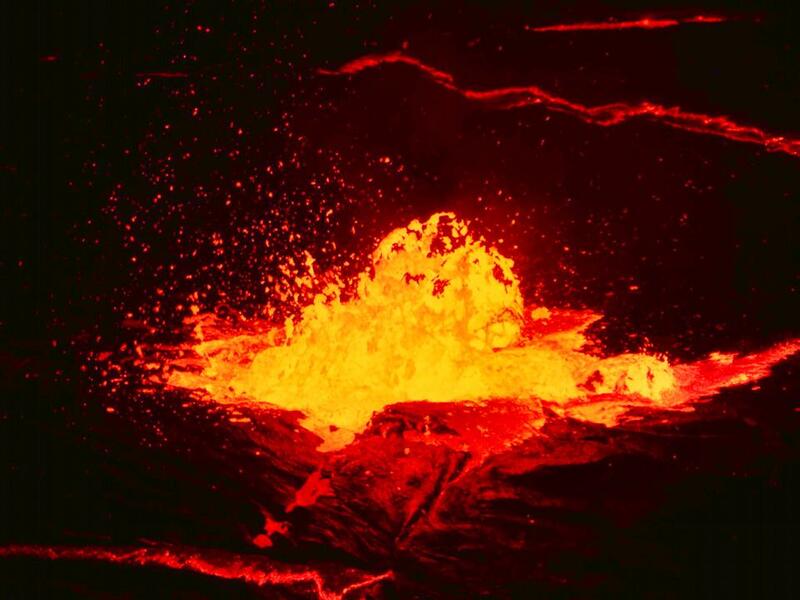 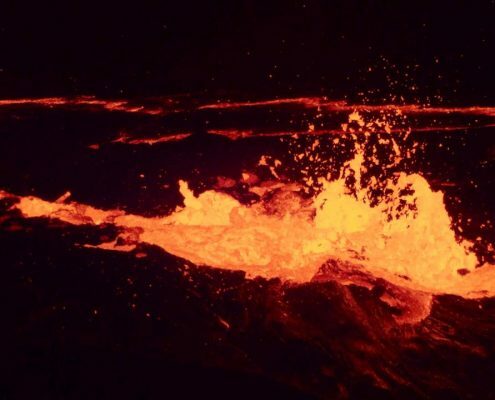 The heat is immense as is the poisonous gas that emanates from the lava (chokes you immediately if you are not upwind). 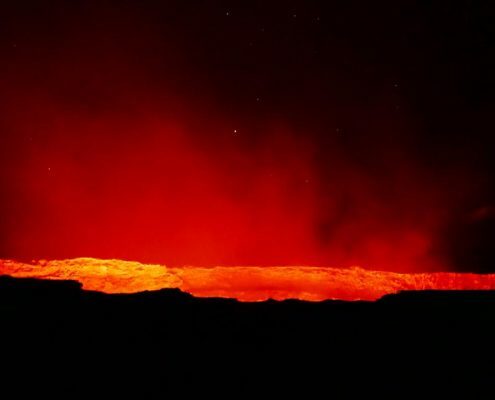 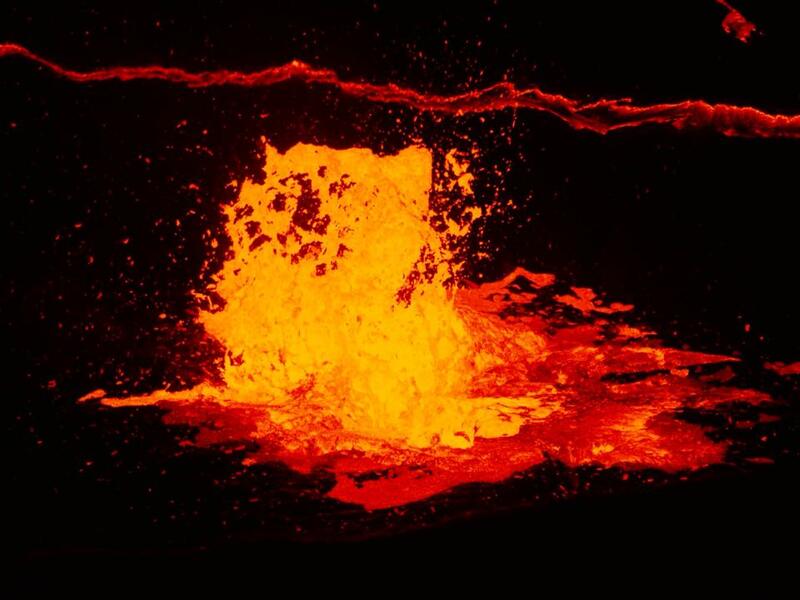 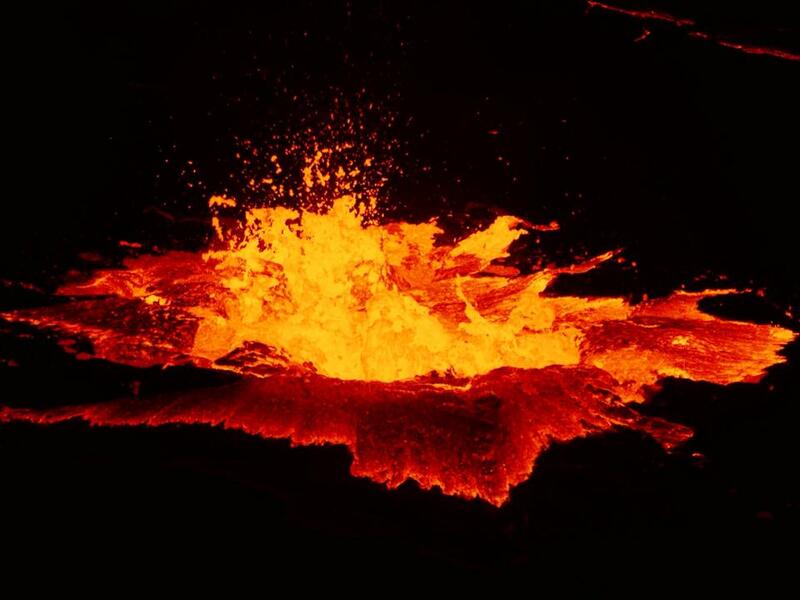 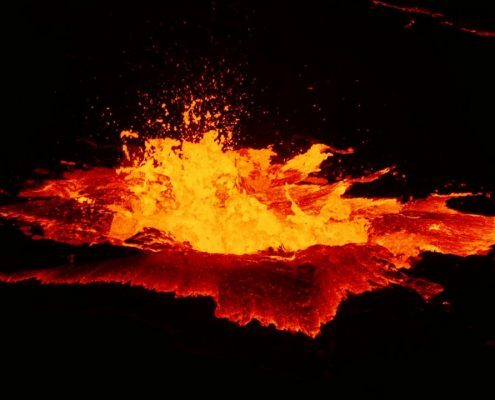 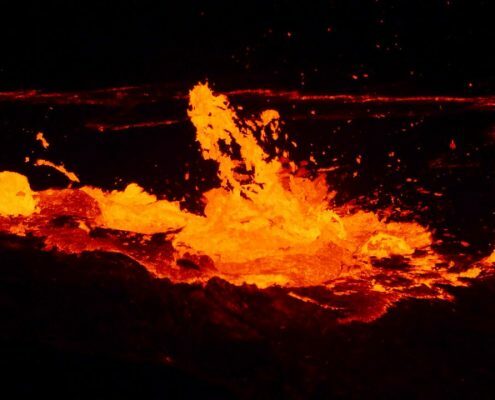 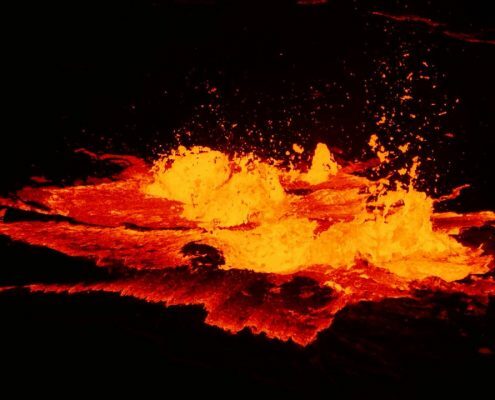 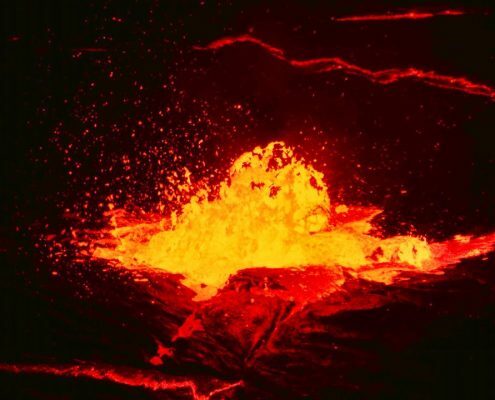 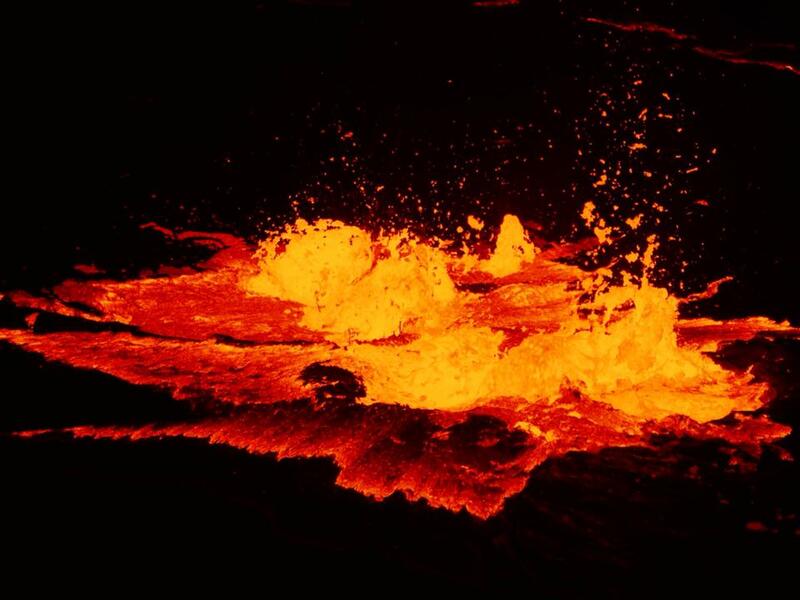 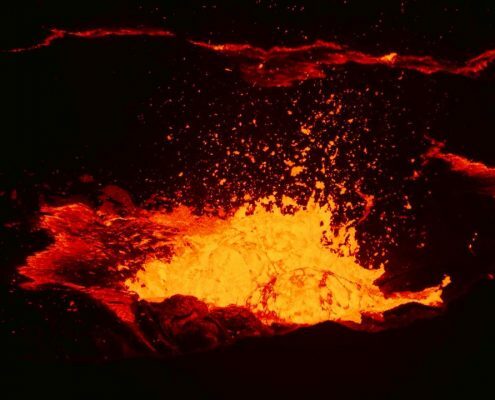 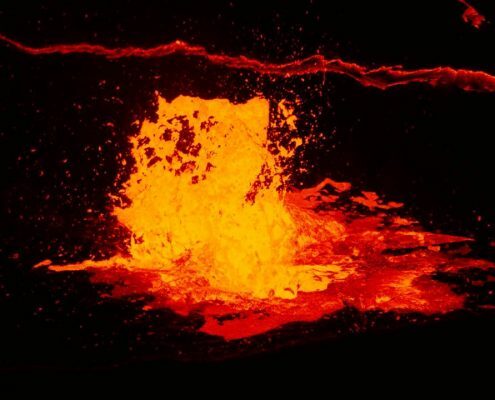 It mesmerizing to watch the lava fountains and explosions as it moves around the crater, hardening in some spots and then again breaking out violently. 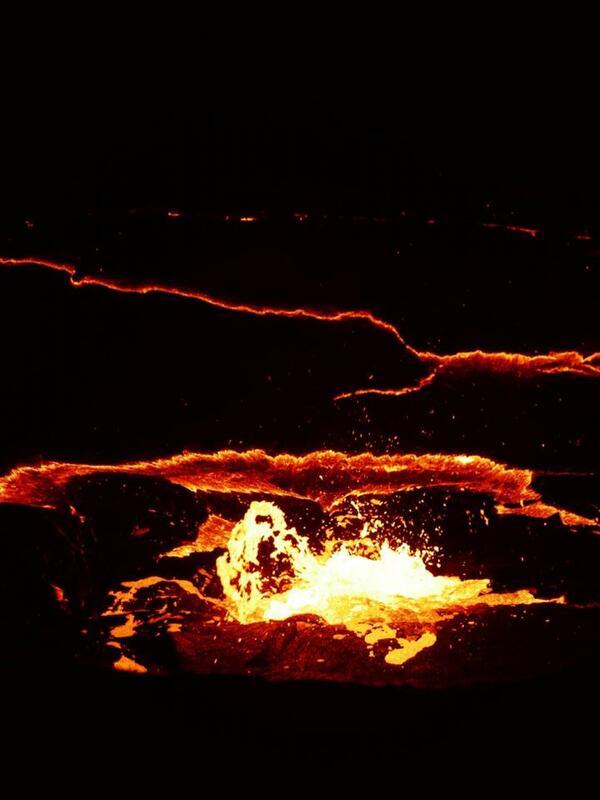 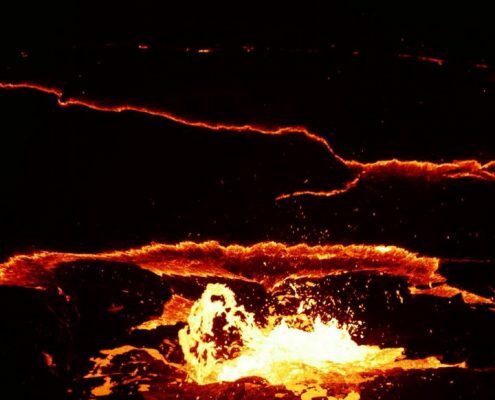 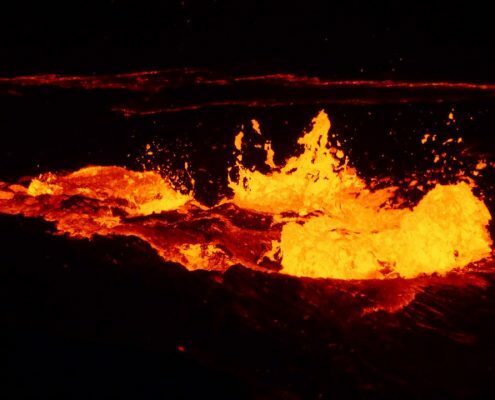 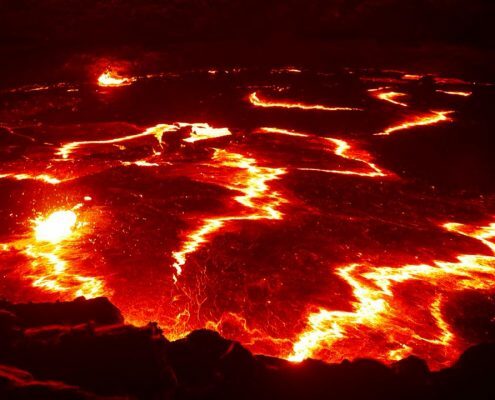 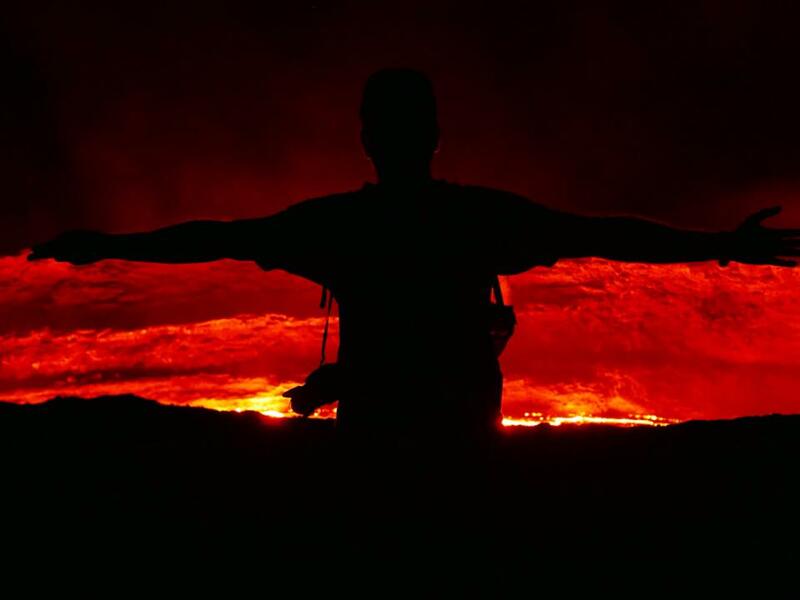 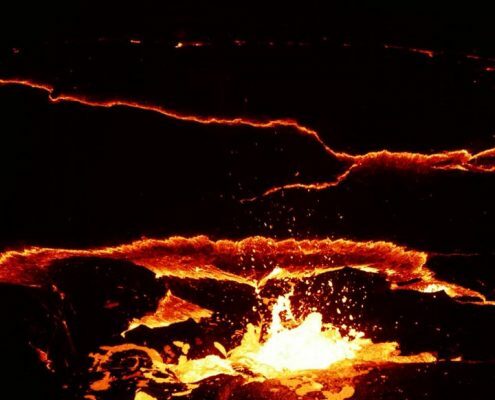 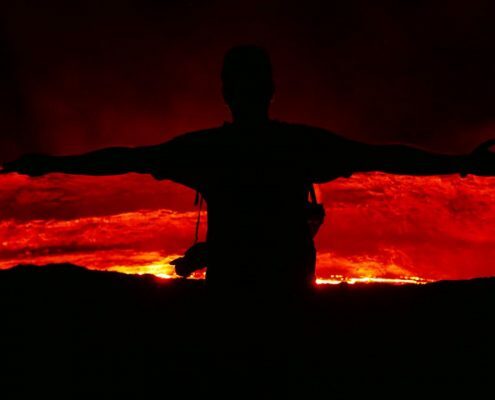 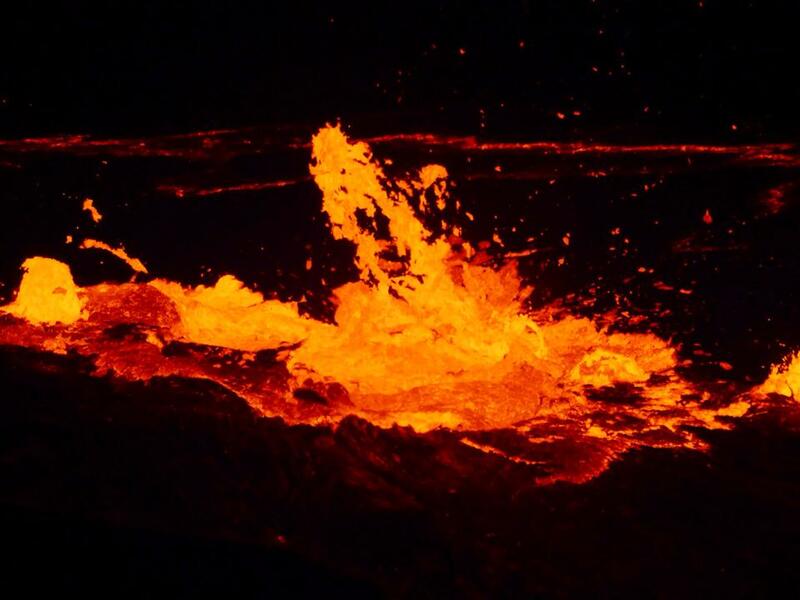 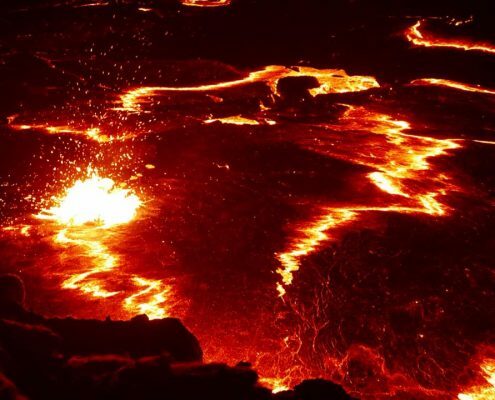 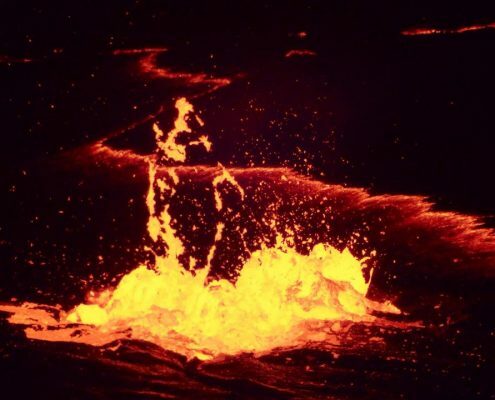 The lava lake has been permanent in place since 1906. 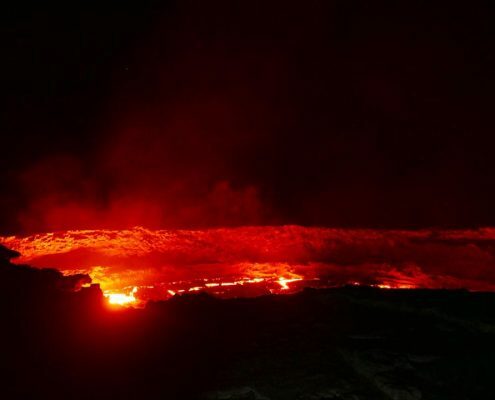 In 2012, a group of tourists was attacked here and several killed and kidnapped as they slept on the top. 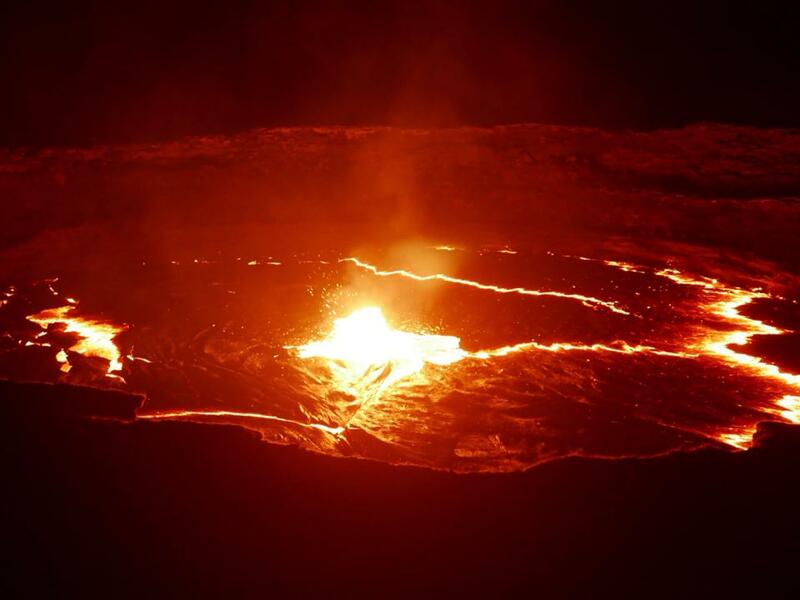 Since then, the tourists (few that dare) are accompanied by Ethiopian military and Afar militiamen. 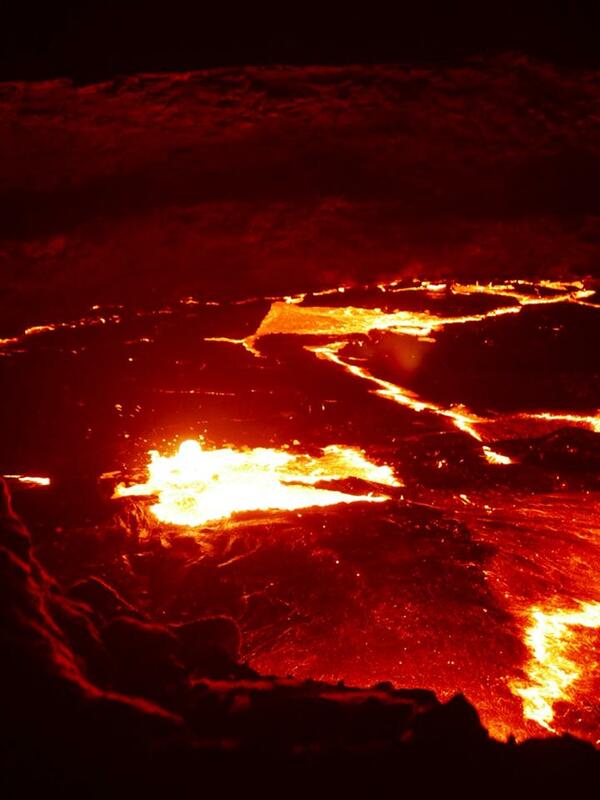 Also, this lava lake was featured in the movie “Clash of the Titans” when Perseus descended into the Underworld!